Political consultant and lobbyist Paul Manafort has been sentenced to an additional 43 months in prison, bringing his total sentence up to seven and a half years. Additionally, he was indicted in New York on new charges of residential mortgage fraud. The last sentence was handed down by District Judge Amy Berman Jackson in Washington on March 13, adding to one given by a different judge in Virginia last week. Manafort will be credited for nine months already spent behind bars with six years and nine months to go. 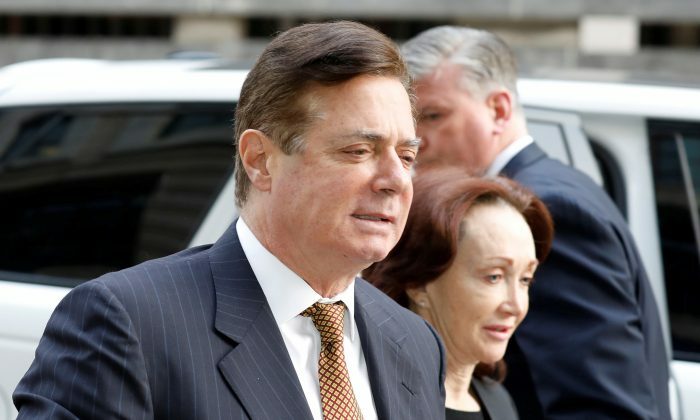 Jackson sentenced Manafort for money laundering, unregistered lobbying, and attempted witness tampering, to which he pleaded guilty in September. In Virginia, District Judge T.S. Ellis gave Manafort 47 months on March 7 for tax evasion and bank fraud. Both convictions stem from indictments by the office of special counsel Robert Mueller, who was appointed in mid-2017 to probe Russian interference in U.S. elections as well as allegations that the Trump campaign colluded with such interference. Mueller indicted dozens of Russians, Manafort, and several others, but hasn’t substantiated the collusion allegations. Manafort had a short-lived job as campaign manager for Donald Trump’s 2016 presidential bid from June to August of that year, after which he stepped down amid reports of his work in Ukraine. In October 2017, Mueller filed charges against Manafort (pdf), saying he hid millions of dollars from authorities in payments from former Ukrainian President Viktor Yanukovych, dodging taxes in the process. He also allegedly lied to banks about his income to get better loans. Manafort also was charged with lobbying for Ukraine in the United States without registering—a seldom prosecuted offense—and lying to the Justice Department. On June 8, 2018, he was charged with witness tampering after he allegedly called and messaged a former associate to give him a “heads-up” about work the two did in connection to the unregistered lobbying, according to court documents. Judge Jackson then sent Manafort to jail to prevent further contact with witnesses. Trump previously said he wouldn’t have hired Manafort in the first place if the FBI or the Justice Department had told him Manafort was under investigation. He also commended Manafort for refusing to “make up stories” about him. Manafort and others stand accused of falsifying business records to fraudulently obtain millions of dollars in mortgages. The allegations appeared to mirror some of the fraud charges in his Virginia trial. During his last sentencing, Manafort said he was sorry for his actions, but Jackson told him his expression of remorse rang hollow. Jackson told Manafort that he had lied repeatedly and committed fraud repeatedly, and there was no good explanation for the leniency he sought. “Saying ‘I’m sorry I got caught’ is not an inspiring plea for leniency,” Jackson told Manafort, who was brought into the courtroom in a wheelchair because of a condition called gout. Jackson could have given Manafort up to 10 years in prison in the Washington case—five for each of the two conspiracy counts. “I am sorry for what I have done and for all the activities that have gotten us here today,” Manafort told Jackson. “This case has taken everything from me already—my properties, my cash, my life insurance, trust accounts for my children and grandchildren, and even more,” Manafort added. “The defendant’s insistence that none of this should be happening to him … is just one more thing that is inconsistent with the notion of any genuine acceptance of responsibility,” the judge told Manafort. Kevin Downing, Manafort’s lawyer, criticized Jackson’s sentence as an unjustified punishment of his client. “It was hostile and it was totally unnecessary,” Downing told reporters outside the courthouse. He did not address the Manhattan charges. Jackson’s sentence may mark the end of a two-year-old legal battle between Manafort and Mueller, who made exposing Manafort’s covert lobbying for pro-Kremlin politicians in Ukraine a centerpiece of his Russia probe, even though the lobbying took place years before Manafort joined the Trump campaign. Manafort’s lawyers suggested their client was targeted specifically because of his decision to work for Trump. “But for a short stint as a campaign manager in a presidential election, I don’t think we’d be here today,” Downing told Jackson. Mueller is preparing to submit to Attorney General William Barr a report on the collusion probe as well as on whether Trump unlawfully sought to obstruct the probe. Trump has denied collusion and obstruction and Russia has denied U.S. intelligence findings that it interfered in the 2016 election in an effort to boost Trump.